Balance is the key to anything in life…right? Our products are made from only the purest essential oils and botanical ingredients. We believe these ingredients reflect the perfect balance of natural and certified-organic products which we have mindfully combined with the latest technology and science. We left no room for harmful sulphates, thalates, parabens, dyes, toxic and harmful chemicals or artificial perfumes. So, when you use SCIOTE SKIN you can expect and receive the skin you have always wanted, the skin you deserve. The definition of MINDFUL is to be aware; knowing something that may be important. At least, this is what the dictionary tells us…what do our hearts tell us? Here at SCIOTE SKIN we believe that it is very important and morally correct to take care of nature’s gifts by making small and responsible decisions to protect the earth. In keeping with this green philosophy as well as being aware of our carbon footprint, we chose simple but beautiful, one hundred percent recyclable, air-less packaging for all of our products. 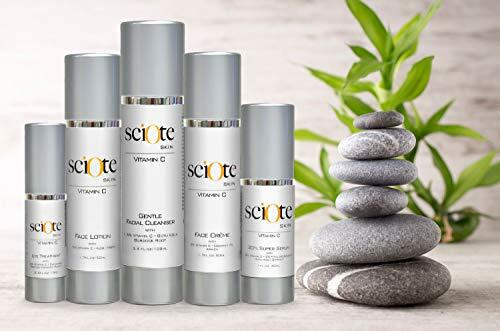 At SCIOTE SKIN we strive to keep our products “local” by sourcing all our ingredients in the U.S. SCIOTE SKIN’s products are and will always be cruelty-free. SCIOTE SKIN strives to be part of the solution now and hope that our clients do too. Knowledge is power! The word SCIOTE is Latin, meaning “KNOW THYSELF”. Our products and philosophies were created and built on a foundation of knowledge. In an industry dominated by marketing and ingredient secrecy we believe it is your right as a consumer to know exactly what you are putting on your skin. We believe that you should never settle when it comes to the health of your skin or knowing what’s in the products you use. Our ingredient lists include the scientific terms as well as the common names of each ingredient. We want to empower you the consumer to make knowledge-based decisions about your health and beauty needs. We want to make sure that when you choose SCIOTE SKIN you not only believe in beautiful, healthier more radiant skin, but you also make the decision to KNOW THYSELF.